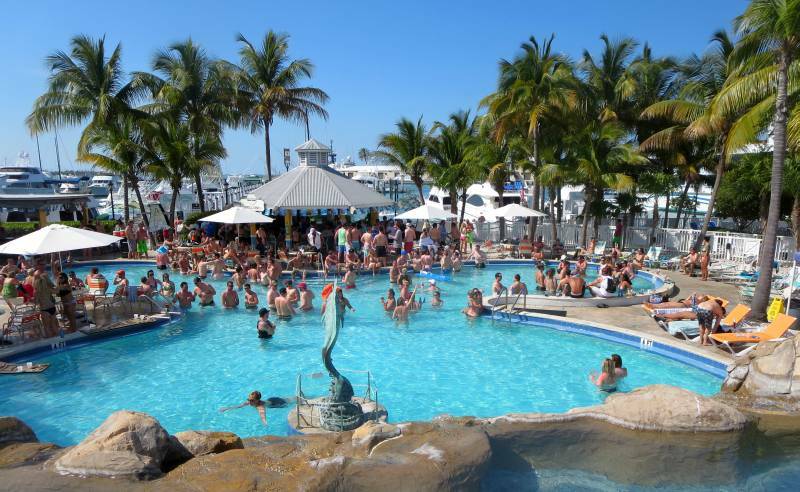 Key West - Tomorrow's the day! Key West - Wrong part arrives again!! Key West - Wrong part arrives!? Key West - Tile fish for dinner! At the Poughkeepsie Yacht Club in Poughkeepsie, NY, there is a sign at the bar, "Free Beer Tomorrow". What a great offer I thought when I first joined, free beer. But then it was pointed out that the "free beer" was always "tomorrow", never today. That's about how I feel about the injector pump. It's been "tomorrow" for over a week now and everyday when tomorrow comes, it's still tomorrow when it's due to arrive! So Tuesday came and went with no injector pump delivery, it's now due "tomorrow"! It would be funny if I wasn't racking up dockage at a frightening rate in Key West. It is not a place where you want to "wait for parts". However, at the moment I'm stuck and once again the part is due tomorrow, on Wednesday. The Volvo dealer promised to meet the delivery at the airport and speed it to my boat for installation. If by some miracle it actually arrives and with an even greater miracle it gets installed and actually works - then we'll try to make the best of it and head out to Newfound Harbor, about 28 miles east of here on Wednesday afternoon, a relatively short trip. From there we wait for good weather to head up the Keys to Miami, it may be awhile. 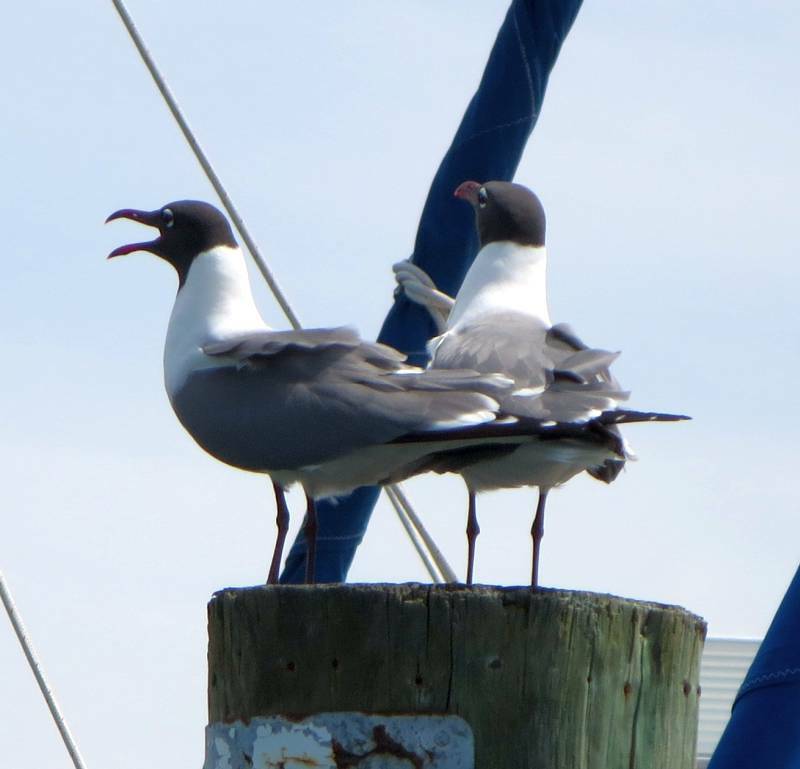 Whenever a dinghy came by, they alternated squawking - a dinghy alarm! It seems we've been trying to get an injector pump forever. When it was first ordered last week, it was going to get here overnight but what was in the box didn't match the P/N on the outside. So a second part was ordered, same result. The third part in the warehouse was manually checked and also found not to have the right part even though it was labeled with the right P/N on the outside. So then they ordered the part from Europe since the USA "stock" had been exhausted. That part is scheduled to arrive tomorrow, Tuesday. So all we can do is sit and wait and hope everyone does their job this time around. The central warehouse for Volvo in the US had moved in the last three months and it appears that someone took advantage of the confusion during the move to make off with several $3500 parts. At least the weather has turned cooler with highs in the 70's instead of mid 80's so it's more comfortable walking around town. 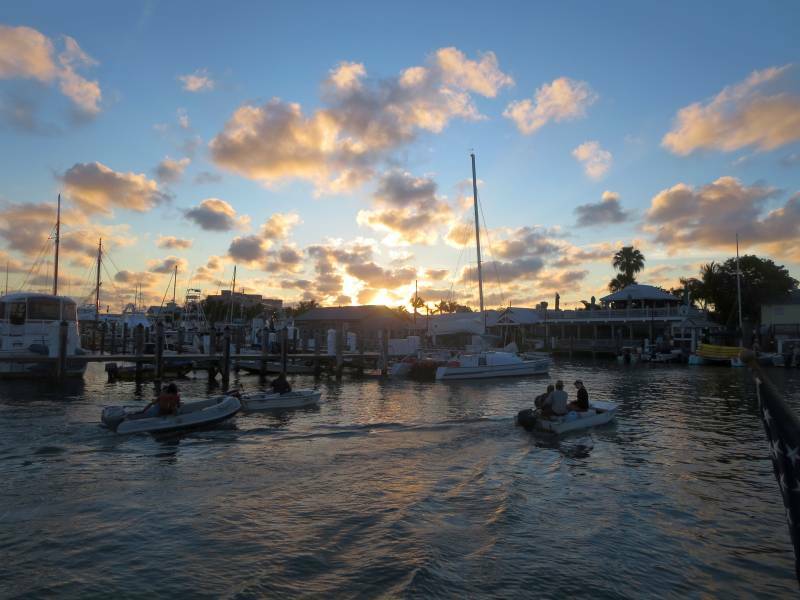 However, there were three cruise boats in today although two left before sunset so Mallory Square was active tonight. 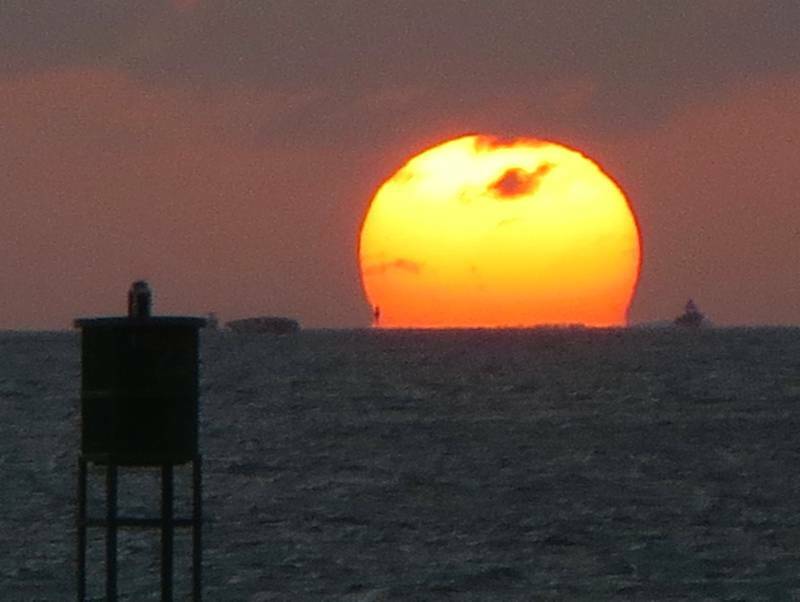 I'm having no luck seeing a green flash. 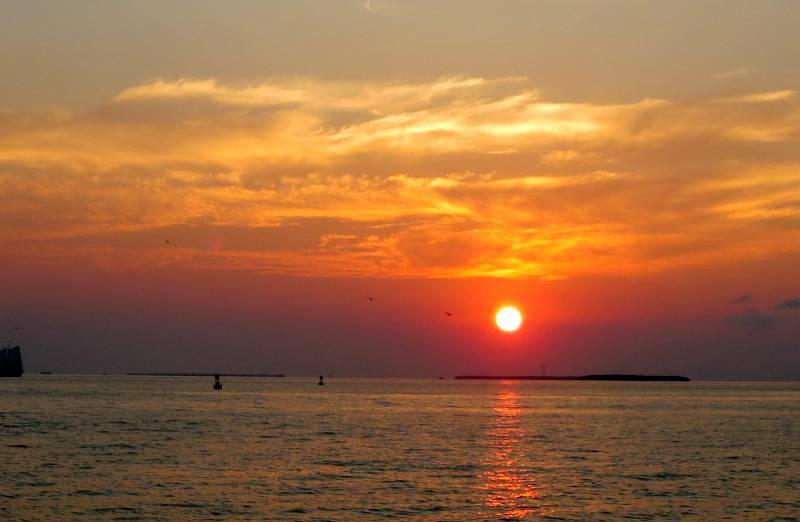 There always seems to be a far away island that only becomes apparent once the sun gets close to the horizon. I have the boat mostly ready short of topping off the water tank which I can do in the morning. All I need is for the injector pump to arrive from Europe and have it installed, we'll wait and see. When three cruise ships are in, Mallory Square is in shadow, not good for business! The injector pump replacement is not due until Tuesday so we're marking time. Tuesday assumes Volvo can actually make an on-time shipment from Europe, never a certainty. So we're catching up on reading and doing the Times Sunday crossword puzzle and watching House of Cards at night, the first season. We were pleasantly surprised by how good it was. Kevin Spacey is outstanding in the lead role. 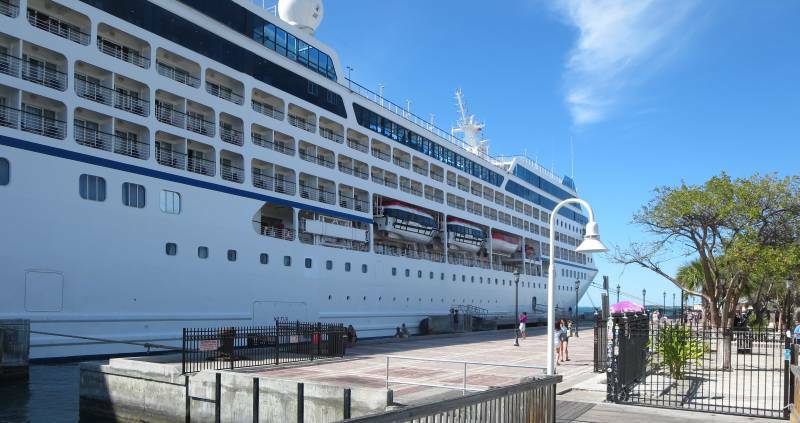 Meanwhile, we continue to do our daily walks and today we discovered that there were three cruise ships docked! The people from those ships can really fill up Duval Street. Key West is not that big. So there were a zillion bikes and filled up trolleys, really crowded. Maybe there'll go away on Monday. The winds have abated but they are still out of the east and we don't expect any change in direction until at least Thursday and maybe not until Friday. 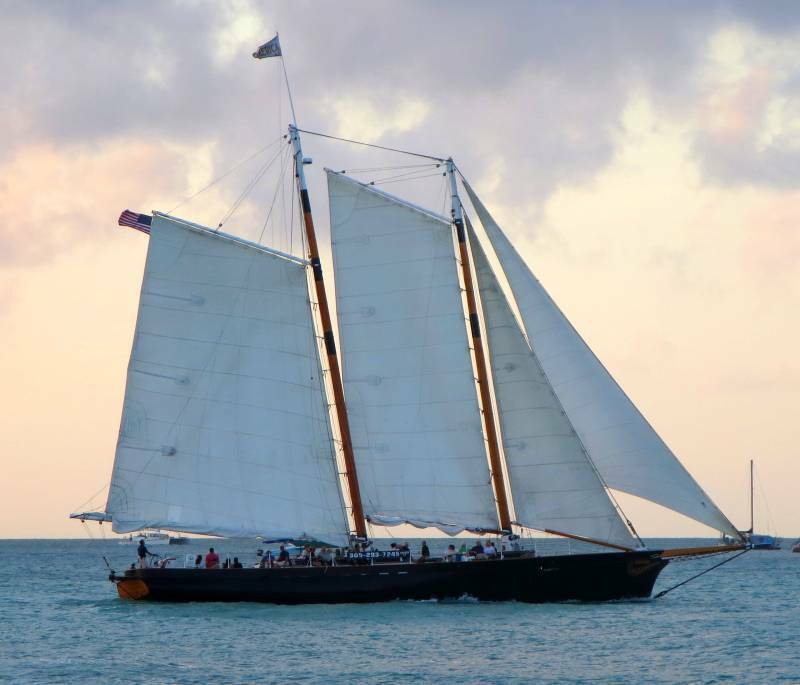 We need a north or west wind to make any headway up the Keys to Miami. It's no fun bucking a 15 kt or greater wind on the nose with the resultant 2 to 3 ft seas if not more. It's a waiting game. 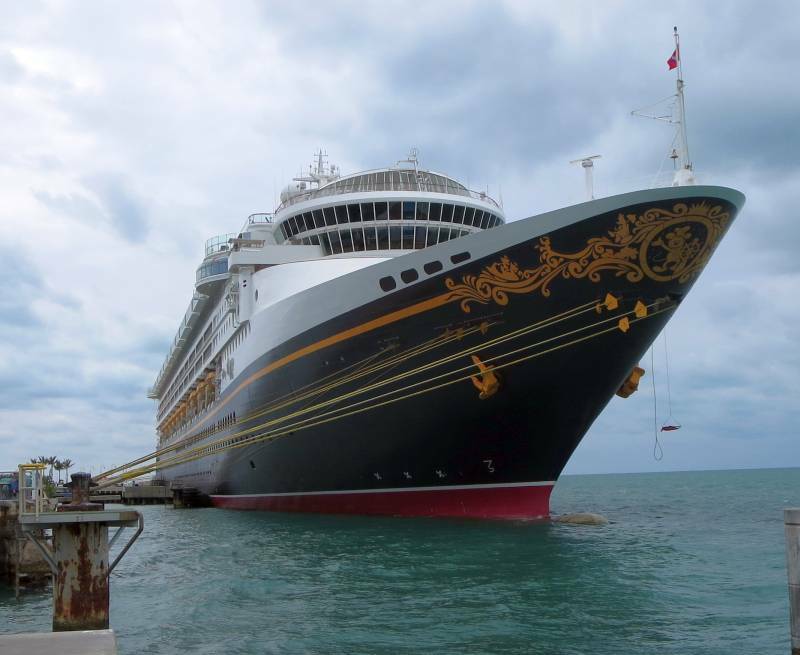 The Disney ship, see the bow logo. We were sitting in the cockpit reading and the hours went by with no word on our injection pump which was supposed to arrive on the morning plane so I called the dealer. After two wrong part deliveries, the dealer asked the shipping warehouse to personally inspect the package before being shipped to ensure the injection pump was actually in the box. As it turned out, the third box and last box in the warehouse in Mississippi (Volvo east coast distributor) labeled "Injection Pump" also had the wrong part inside. It appears that someone was stealing injection pumps ($3400 each!) and replacing the contents with something much less valuable. So now a new injection pump was ordered directly from Europe and it's due to arrive by Tuesday (I'll believe it when I see it). If the fairy tale comes true, all will be made good on Tuesday. It's rather discouraging when a company like Volvo can't ensure the goodness of their inventory. I filled out an email form on their site and I'll write a more detailed letter on Sunday. These people are a bunch of incompetents. For the second time the Volvo dealer ordered the same P/N and for the second time the wrong stuff was in the box even though it had the correct P/N label on the outside. I found this out after the mechanic failed to appear when expected. I had to call the dealer to find out the status, not a sign of good customer relations. So now they've order the part for the third time! It's supposed to arrive Saturday morning and could be installed by early afternoon. If early enough we could still make it out in time to reach Marathon or at least Newfound Harbor. However, all is up in the air at the moment, I've lost confidence in these guys. When queried about the problem the response I got was, "It's not our fault, Volvo made the mistake", as if they didn't represent Volvo to the customer, groan. So we sit here once again. Is the third time a charm or will the dealer strike out? According to him, "This has never happened before! ", Ha! I bet he tells that to everyone. 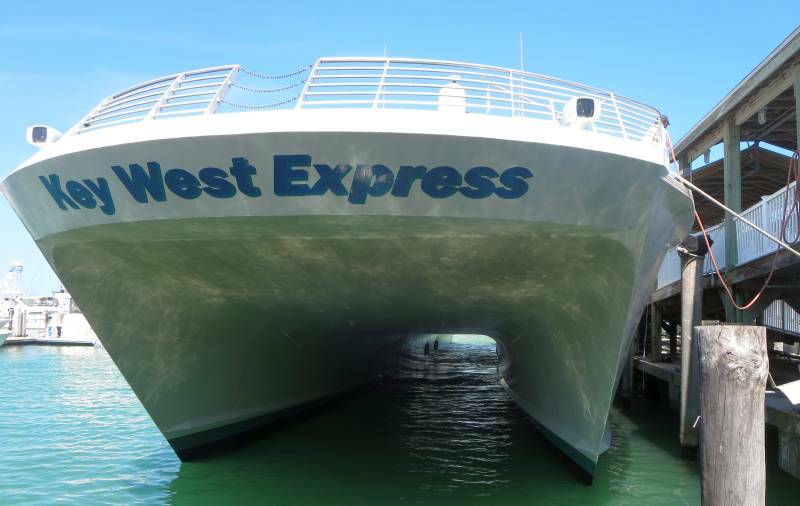 If we can't get out on Saturday, we'll be here until Friday when the winds are due to abate out of the east, that's another $700 in dockage fees, Key West is not cheap. All this assumes that the new injector pump fixes all our problems (and that the new pump is not defective...) Want to take bets? I was full of good cheer this morning since the new injector pump was due in and we could push off heading east. Then I got this call from the Volvo dealer. He said that Volvo shipped the wrong part! the packaging on the outside was correct and had the right part number but what was inside was not an injector pump. I'm not quite sure what it was but it was nothing like what I needed. At first I thought it was just an excuse for him not being able to get the right part shipped in time but he sent a photo of the packaging and perhaps his story is true (see photo). I kicked myself for giving into him and ordering the part from him instead of McDonnell Marine up north! If he can get the part installed by 1:00, I can still make it to Newfound Harbor, about 28 Nm east if we run out of time for Marathon. The wind is still out of the west Friday afternoon before turning north at 20 to 25 kts with seas, according to the NOAA forecast, of "very rough". If we only make it to Newfound Harbor, we'll be there for several days waiting for weather. It appears we'll be in Marathon for at least a week, waiting for winds out of the west or at least calmer winds before heading to our Marine Stadium anchorage. So we sit here. 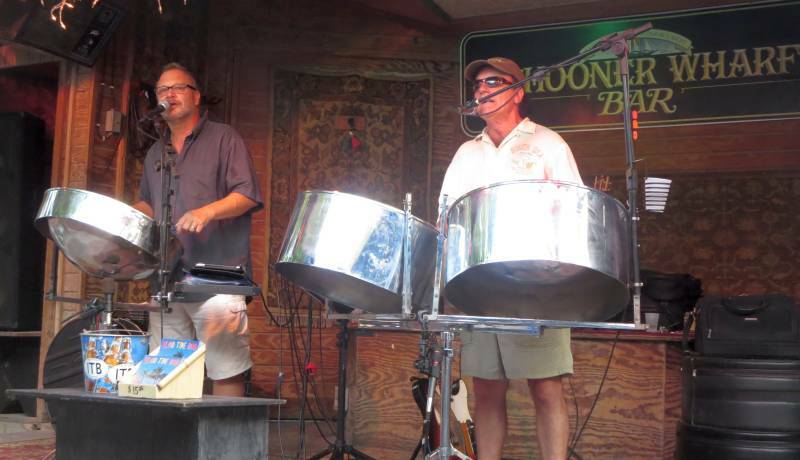 We did go one last time to Schooner Wharf to listen to Island Time Duo that plays steel drums which we like. But after two months it's time to leave. On our webcam at home in New York we can even seen bare ground in places, at last and the river ice is breaking up. Spring is on its way. We prepared, hopefully, for a Thursday departure by doing a laundry, too optimistic. 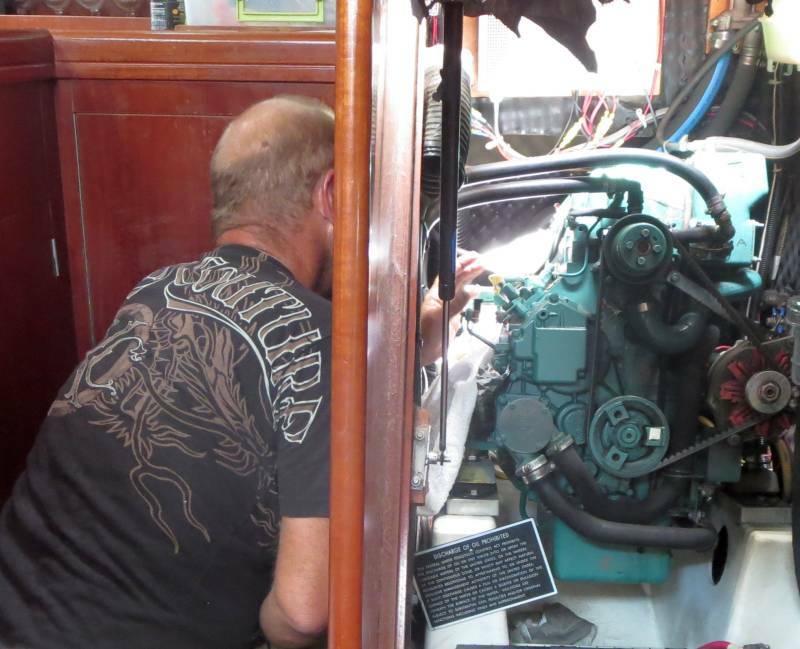 The tightening of all the connections was not successful yesterday so today on Wednesday the mechanic tried replacing all the crush washers and reassembling the injection pump. However, it was to no avail, it still leaked after reassembly. 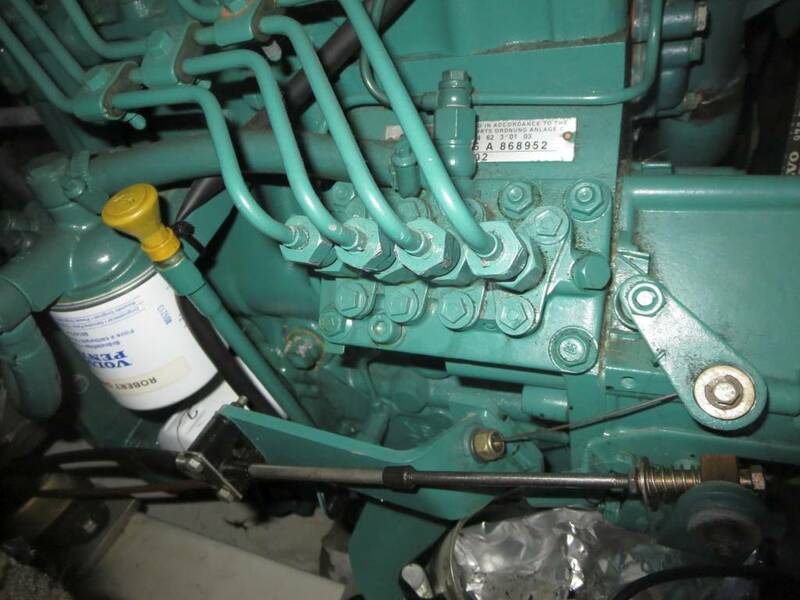 A fuel leak in the engine compartment is not something you want to let go. Now, we are dealing with diesel and not gasoline so it's much less combustible but it's still will burn quite well once ignited. An all too familiar sight! 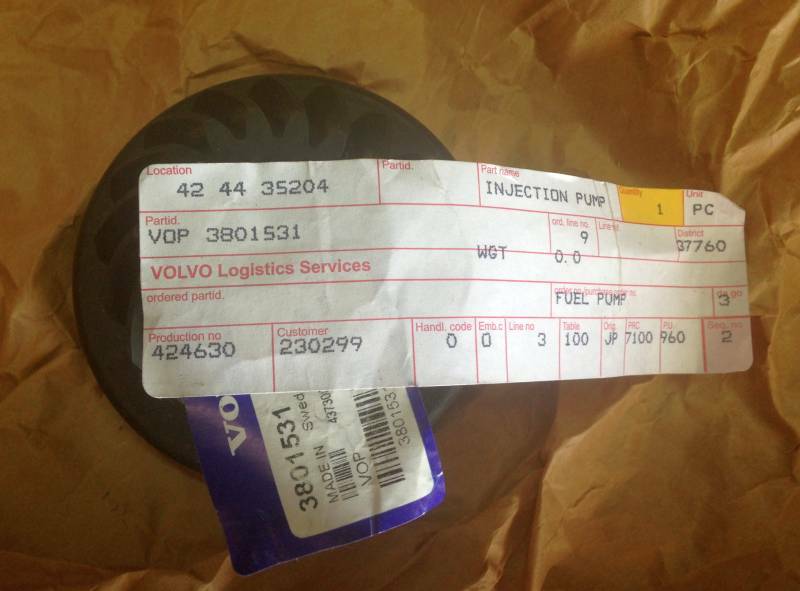 So with the news that the leak was still present I was on the phone to my Volvo supplier in Connecticut I've dealt with for the past 10 years, ready to order a replacement for the entire injector pump assembly. I had to place the order by 4:00 pm to guarantee delivery by 10:30 am the next day. Meanwhile, the mechanic is on the phone to his boss and he hands the phone to me. It seems that the dealer here will not install any parts bought from anyone other than him!! So on one ear I have my supplier in Connecticut and on the other ear the guy down here refusing to install a part bought somewhere else and I have a deadline to leave on Friday - giving me one day to get the repair done before the weather closes in for a week or more (strong winds out of the east - the direction I'm headed). So I dropped the phone to McDonnell Marine (sorry about that) to listen to the local Volvo deal make his ultimatum. Well, he has me over a barrell. If I don't leave Friday, the weather report says Ill have strong east winds for the next week, that would cost me about $700 additional in dockage fees. So I cave and agree to buy the part from him at full retail on the promise it'll be here and installed on Thursday and I'll still get the $650 return fee for the old part. I was promised a call back to be sure everything was in order but never got the call. I hope that doesn't mean he couldn't arrange to get the part by Thursday?! The mechanic came by first thing in the morning with the special tool he needed to tighten the injector pump nuts in the tight spacing. The adapter cost $120! A standard open end wench did not fit, the fingers were too wide to go between the nuts on the injector. Anyhow, after tightening everything, the problem promptly got worse. It is tough to tighten a nut on a copper compression washer. They are made to be used once and not retightened but it was worth a try. The next step is to replace the washers with new ones and see if that will stem the leak. If that doesn't work, then it's off to buy a new injector pump, not a small expense! Meanwhile, we're running into our deadline for leaving Key West. We're still planning on leaving Friday if the weather holds and if we can get the injector leak fixed in time. 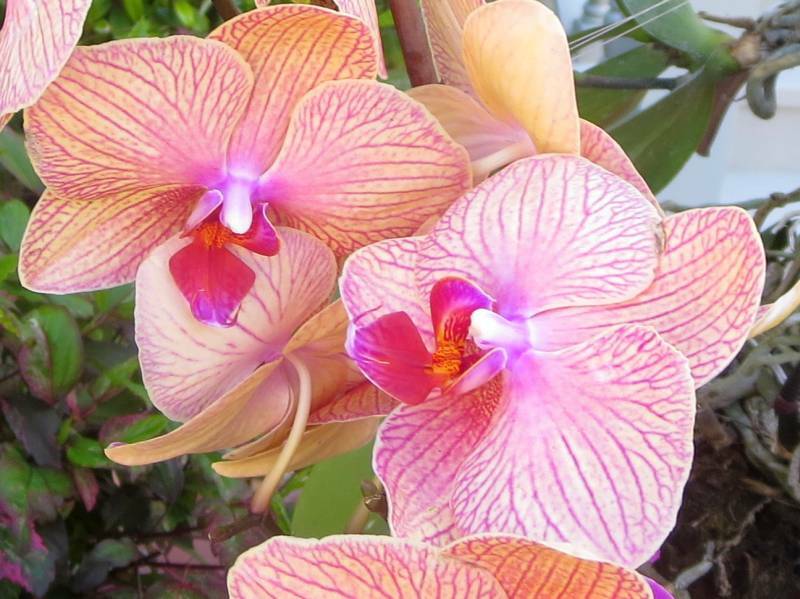 With all the excitement of the fuel leak, we delayed our walks until the afternoon and once again marveled at the abundance of orchids. It seems every second house has them on display, tied to palms and other trees in the front yard. I never tire of admiring them. We viewed the sunset tonight from our harbor. Mallory Square is really crowded, it's more peaceful here. We're all on pins and needles about the fuel leak, we'll be glad to get that settled! The mechanic is due back Wednesday afternoon to install the new compression washers. 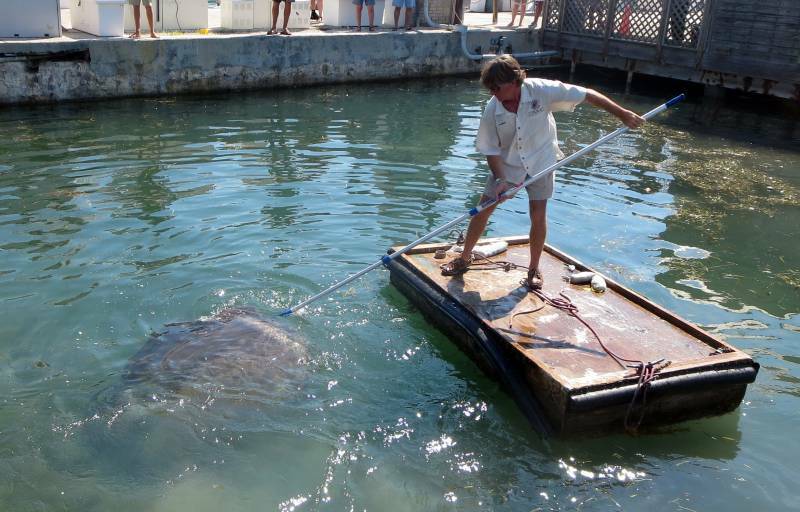 He's trying to prod the sunfish towards the opening, hard to do - the sunfish is big! The technician came by today to look at our fuel leak but didn't have the right tools for the tight spacing between the injectors so he left with the intention of getting back later and pricing a replacement of the entire high pressure fuel pump, not a small expense. So I called Brian of McDonnell Marine in Connecticut and he suggested tightening the connections instead of a full replacement. Late this afternoon I got a call from the technician and he's coming over Tuesday morning to do just that with the proper tools this time. Hopefully, that'll be enough to stem the flow until I can get back north. We'll see Tuesday morning. Meanwhile there was excitement in the marina. 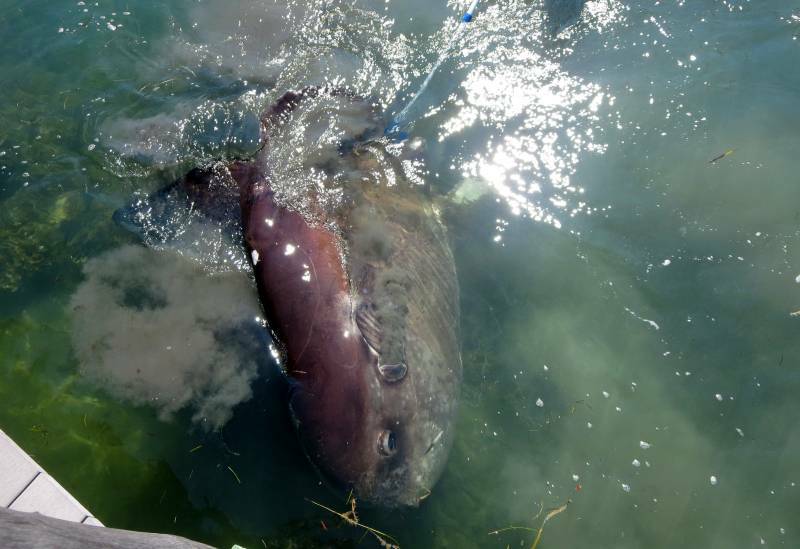 A sunfish had entered the harbor area and was swimming around but then got caught in the fenced in area where they used to keep turtles for the restaurant before it was outlawed (there are holes in the fence). The sunfish got in but couldn't get out. So several of the locals spent a couple of hours coaxing the sunfish out a narrow opening in the fence, he eventually made it. They are huge fish and very odd shaped - like a pancake with fins. We'll still looking at the weather reports, waiting for a window. Friday looks good now but that may change any moment. It's nice to have friends that fish. I'm not a fisherman myself but I do like to eat fish, especially fresh fish. The tile fish of the Keys is a thick, white fish that can be prepared a variety of ways, always delicious. 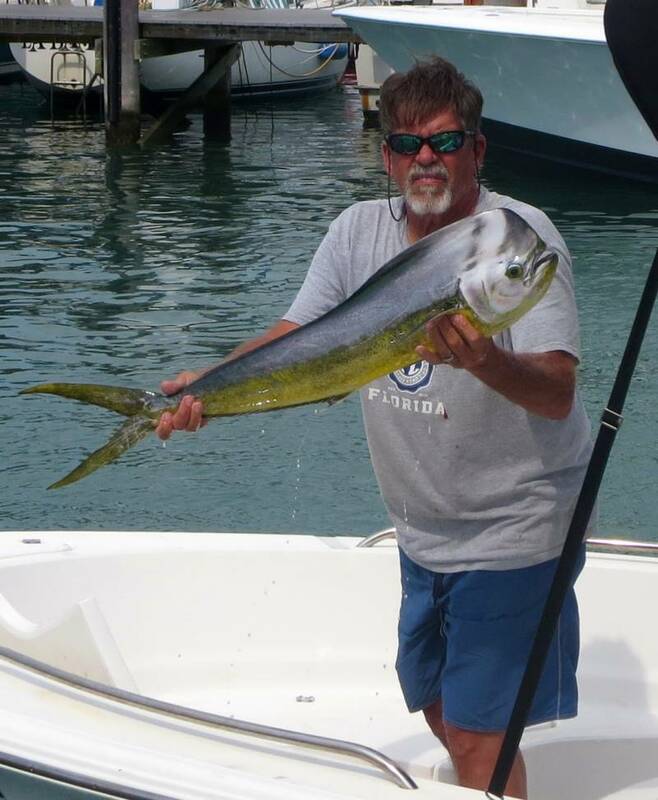 Larry came by today to show the dolphin (Mahi-Mari) that he caught this afternoon and to give us fillets from two tile fish he also caught. Unfortunately, he won't be around next year since he plans to spend that winter in San Diego. Perhaps we'll meet up again the following year. We do like the fish he shares with us! I did some more investigation on my fuel leak. It appears to be at the fuel distribution block and at the seal at the bottom. One suggestion I received was to loosen the four flange nuts and then retighten them. Perhaps that would be enough to stop the leak. I'll try that Monday. Meanwhile, Hoolie and I went over to Mallory Square again tonight but the sunset never reached the horizon, too many low clouds. Still, there were bunches and bunches of people milling about as always. 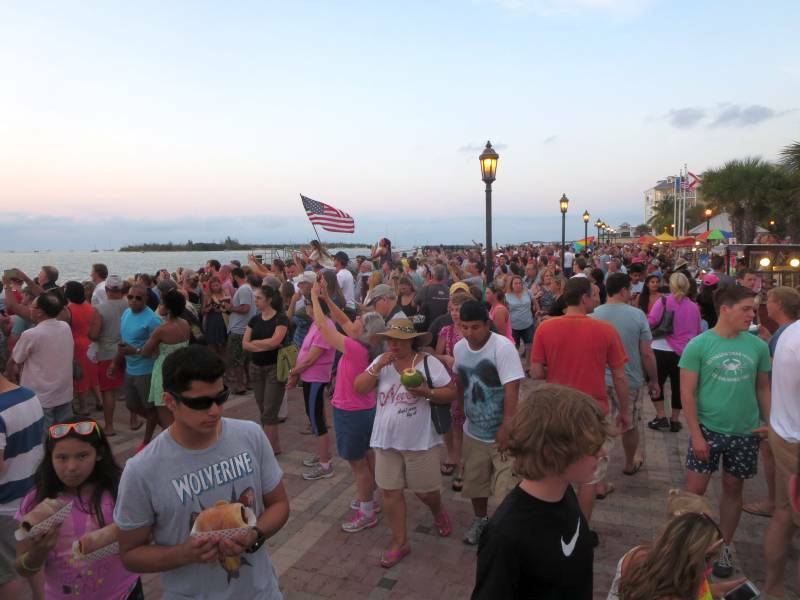 Mallory Square is a popular place at sunset. We're still watching the weather, the best day is flipping between Thursday and Friday now, it's like flipping a coin, it changes with every forecast. I changed the oil and filter in the diesel (Volvo) and the outboard and in the process noticed that the diesel was leaking fuel, misting actually. It's not a bad leak but it could get worse and needs attention. So in this internet age of connectivity I took a video of the leak on my iPhone along with a few photos and emailed it up north to Brian of McDonnell Marine. Hopefully, it just requires tightening of some of the connections and not a complete redo. However, knowing which nuts to tighten and which ones not to touch is not trivial, hopefully Brian can help. Tonight we were invited over for fresh caught grouper by Harry, our friend from Amenia, NY who"s down her on retirement. Paula cooked a wonderful dinner. There's nothing quite like fresh grouper and Paula knows the best recipes. 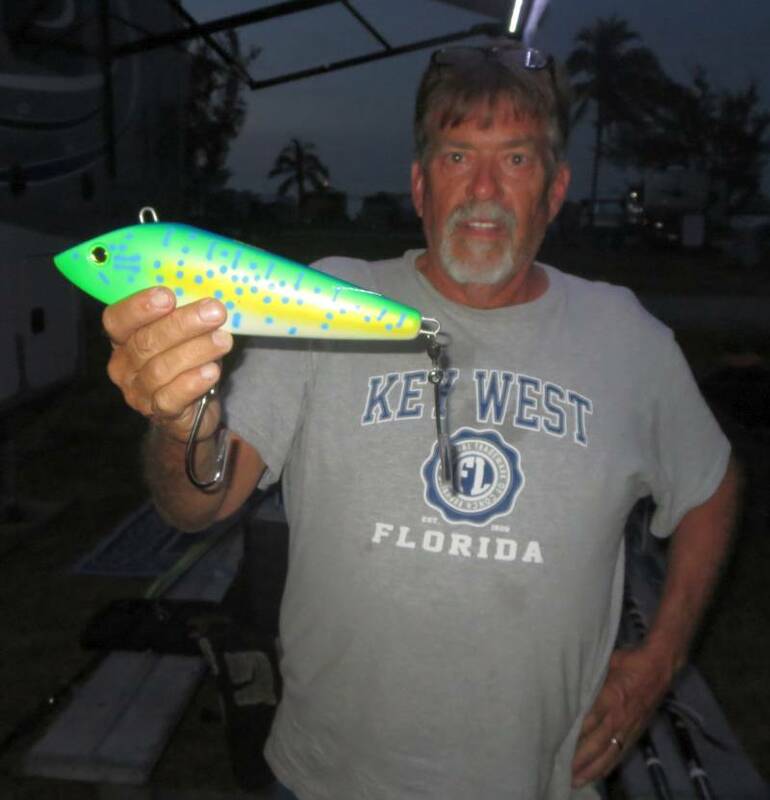 Harry's going out fishing tomorrow with a huge lure to catch wahoo, I'm sure he'll get one or several. 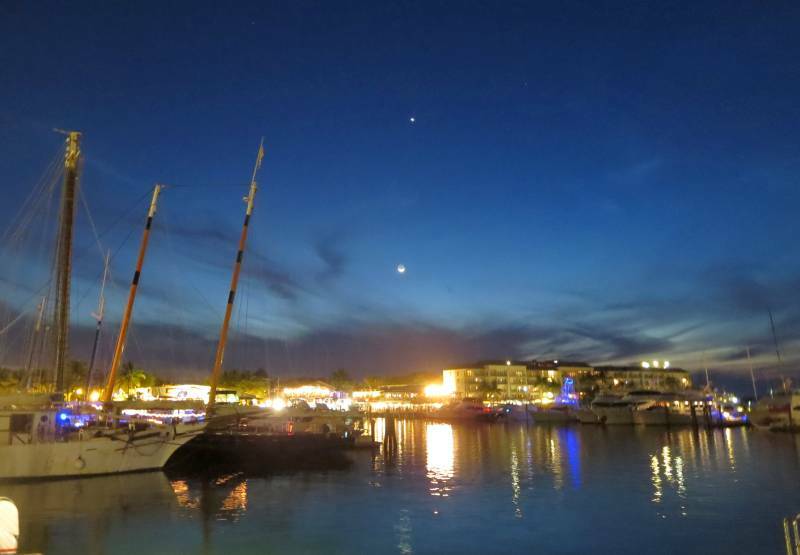 On the way back to the boat, we noticed the night sky with a new moon, Venus and with Mars just to the right of the moon, beautiful. 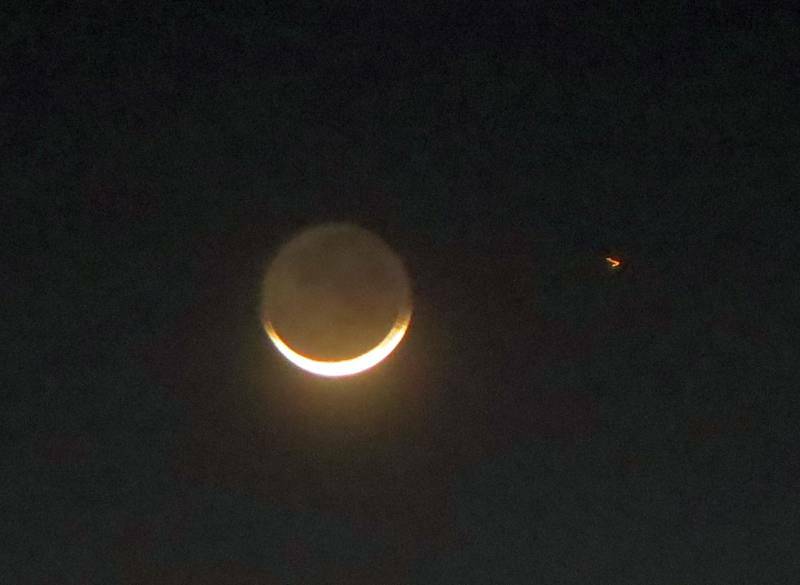 It's been an unusual two months with so many conjunctions of planets and the moon. As to our casting off date, it looks like Wednesday now but that'll probably change multiple times before we leave. We're still weighing when to go. Every morning the first thing we look at is the weather report and, of course, the further out the prediction, the less it's accurate and yet that's where we're the most interested. So for the present, next Friday is looking good but not Saturday which has winds of 20 to 30 kts. This week has a gap as far as spring breakers are concerned. The Florida breakers have come and gone and next week the midwest is due down here. 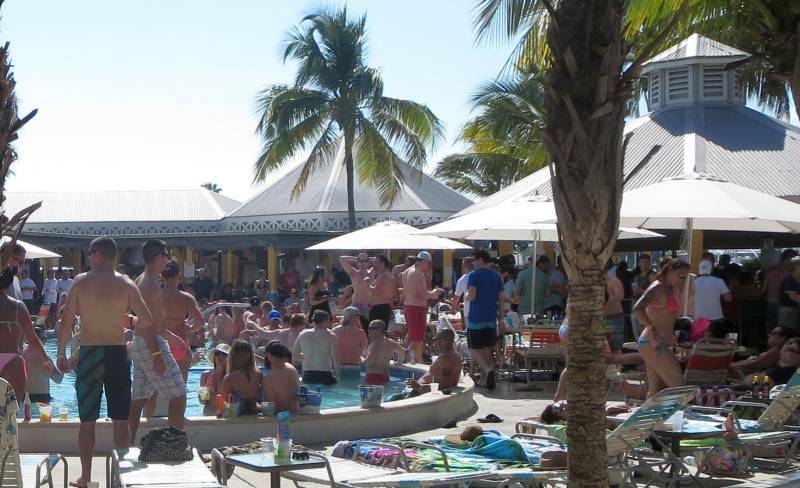 Evidently, the three days between St Patrick's Day and the weekend are not big days for spring breakers. Nevertheless, the one, large pool that's open to the public is doing a land office business, even this week. Just take the picture above and triple the number of kids and that'll approximate last week when the Florida breakers were in full stride. You'll notice the swimsuits continue to get briefer (is that a word?). There can't be much further to go but believe it or not, there's still room (as seen on a couple of breakers). I just remembered I didn't provide the answer as to why Schooner Wharf has beach umbrellas on each table. Well, not all the tables, just the ones under the overhanging tree (hint, hint). You should guess by now that's it's to keep the customers from experiencing a natural phenomenon of Key West from overhead birds. They keep dinner from being decorated by feathered friends. We do not yet know our exact departure date, it all depends on the weather. We would like a calm day or a rare west wind, north would be okay too - just not an east wind which is the direction we're heading when returning to Marathon. So for now I still go over to Mallory Square but I'm realizing that's it's a rare viewing spot that doesn't have a far away island between you and the sun - so no green flash. Oh well, I'll move around some more tomorrow. We have been gradually adjusting our schedule earlier and earlier to get in line with the time change. The clocks may change but your body doesn't, at least not right away. So this morning we were early enough to see the sunrise. Kenny Lutz had a 5:00 ticket on the Key West Express and he bought us shrimp for a going away dinner which we had in the afternoon. I showed off my new tool, the Morty the shrimp peeler.which makes short work of peeling shrimp. It takes about 5 seconds to peel each shrimp once you get the hang of the tool, much faster than doing it by hand. Kenny did the last dozen or so and was going pretty good at the end. Ann put the shrimp to good use in a newburg type sauce, it was a hit. We're starting to get ready to leave so one requirement is to replace the zinc which necessitates a diver. After several tries (don't wait until the last minute like I did) I found a diver that makes his main living gathering lobsters. 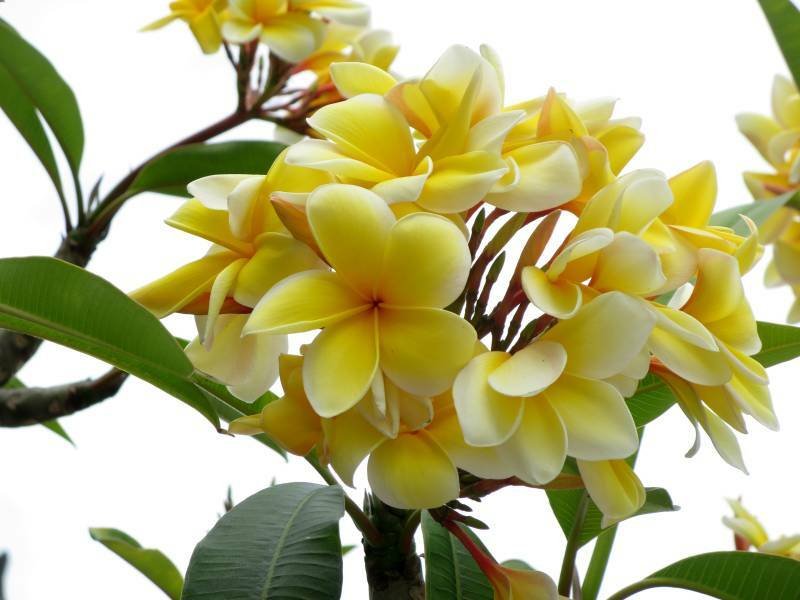 In taking to him, it turns out that the price has spiked in recent months due to the demand from China. The local lobstermen are getting upwards of $20/lb! However, to get top price they lobsters have to be perfect. That means no missing legs, no missing antennas and they have to be "spunky" when examines by the China buyers. 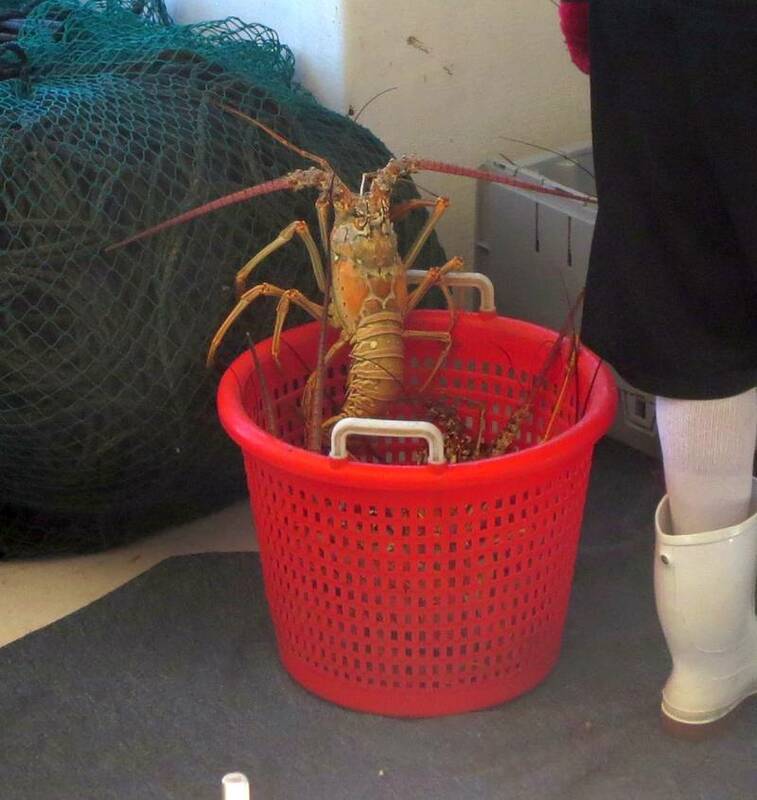 They are shipped over there alive and he heard they sold for as much as $100 to $200 a lobster when landed there. 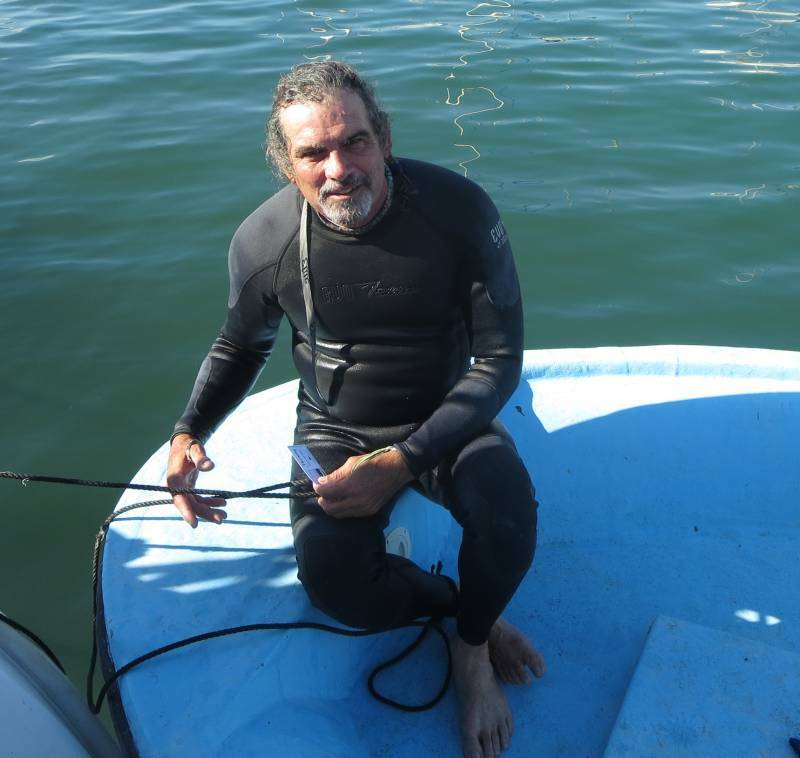 The lobstermen are very happy as are the divers who can recover lobsters undamaged for the best price. At any rate, he replaced my zinc and now I'm ready to go. I still have to change oil and filters and wash the boat, that's the next two days. 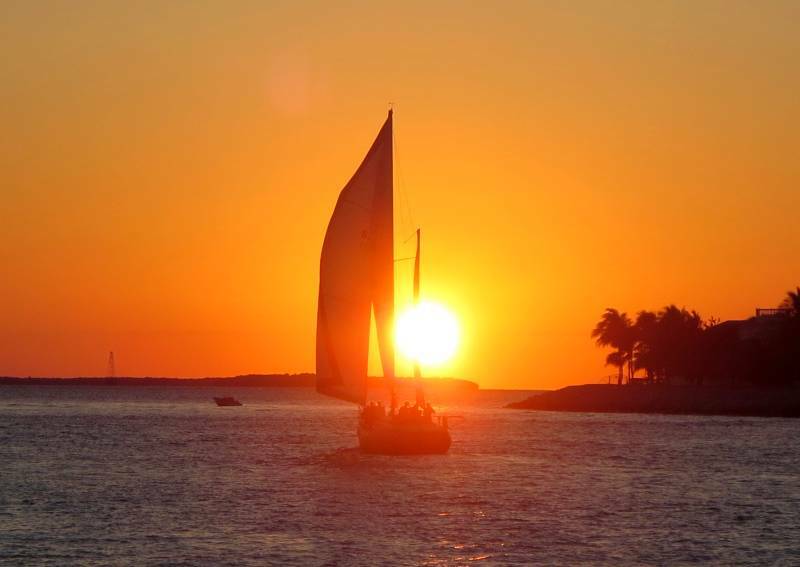 Just another great day in Key West. It was a little cooler today with a morning temperature of 74 (77 yesterday morning). With bright sunshine out, we headed over to the St. Patrick Day street celebration at Backspace, the new restaurant that replaced the Irish pub that was there last year. Although Backspace is not Irish, they continued the Irish tradition of the street fair along side the restaurant. They had an Irish band, of course, and had a buffet for $10 with corned beef and cabbage, shepherd's pie, or bangers. I had just the corned beef and cabbage, quiet passable for $10. They had a beer vendor for $5/drink which was fine. So we all enjoyed the food and music, a good start to the afternoon. Then it was back to the boat to rest up for the night. Skraeling was back at Schooner Wharf Tuesday night so we headed over at 6:30 pm and just now got back at 8:30 pm. The band was still going strong and the star was still the fiddler. There's something magical about watching an expert fiddler in person. Recordings do not do it justice, it's not the same - you don't get the audience interaction and the true feel of the music. 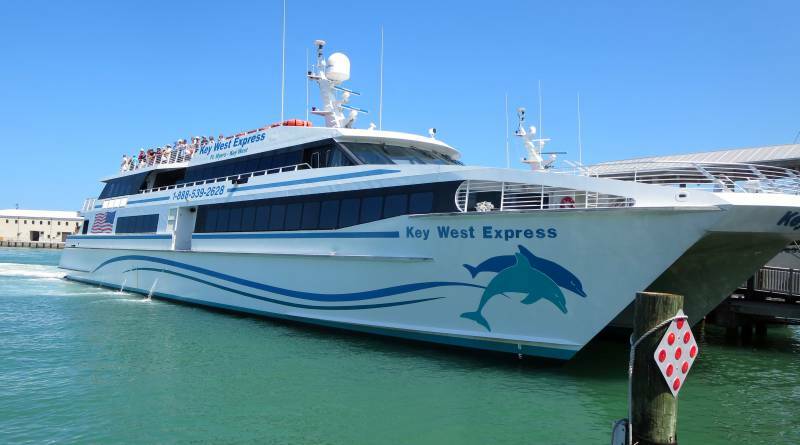 There is a huge power catamaran that shuttles between Key West and Ft Meyers, called the Key West Express. It's a 3.5 hour trip and Kenny Lutz left Monday morning at 8:30 and I met him at the dock. We had cleaned out the aft cabin that morning, a monumental effort all by itself. It's so convenient to just pitch stuff in the aft cabin but when there's company, it has to be emptied. So I met Kenny had led him to our boat. Like everyone else, he had to climb over the bow and he did fine. We take the same slip every year and we like the privacy of the bow in approach. We don't mind coming over the bow. We had lots to catch up on, we hadn't seen Kenny for many months. Ann prepared a chicken dinner which we both dug into, nothing left. 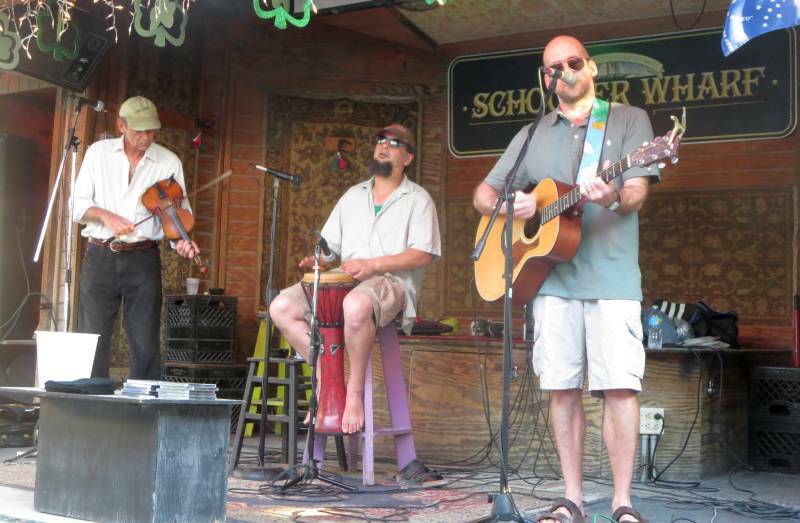 Then we headed over to Schooner Wharf where Skraeling was once again the featured band from 7:00 to 11:00 pm. The star of the band is the fiddler. I cannot imagine anyone playing faster, his fingers were a blur and the sound was magical. We're back at the boat now with a summer's night, beautiful. We'll enjoy St Patrick's Day on Tuesday at a local fair, far from downtown on Duval - it's just too crowded down there. Corned Beef and Cabbage is ahead of us for sure! Sunday is donut day although we slimmed it down to one danish and one scone. So we had a morning coffee and read the local paper. Kenny Lutz called and confirmed he's coming on Monday via the high speed shuttle from Ft. Meyers. He'll be here over St Patrick's Day and leave on Wednesday. It will be fun to have PYC company. 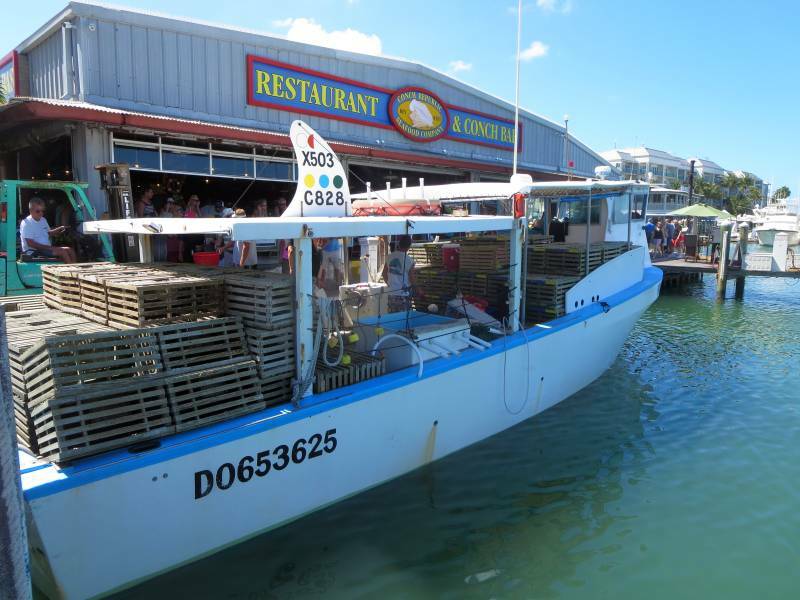 I was walking by one of the restaurants in the harbor and witnessed the arrival of a lobster boat that brought in a fresh supply for the Commodore Restaurant. They were busy off-loading the catch and had the lobster pots on the back of the boat which they later took to land. 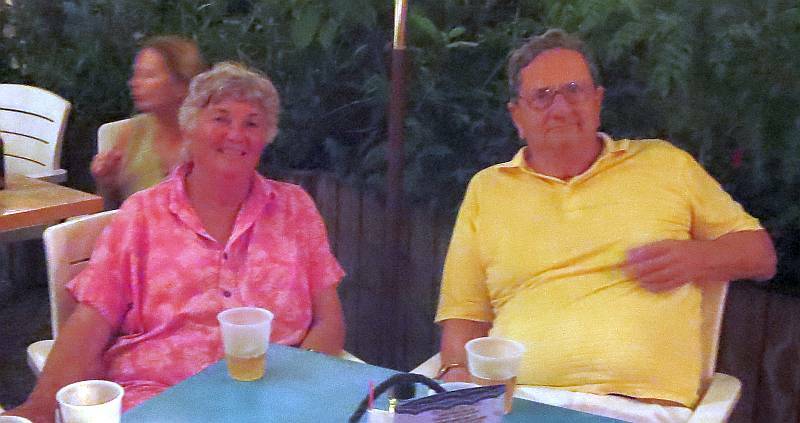 The big event of the day was a visit from Harry, our friend from Amenia, NY who's down here on vacation. 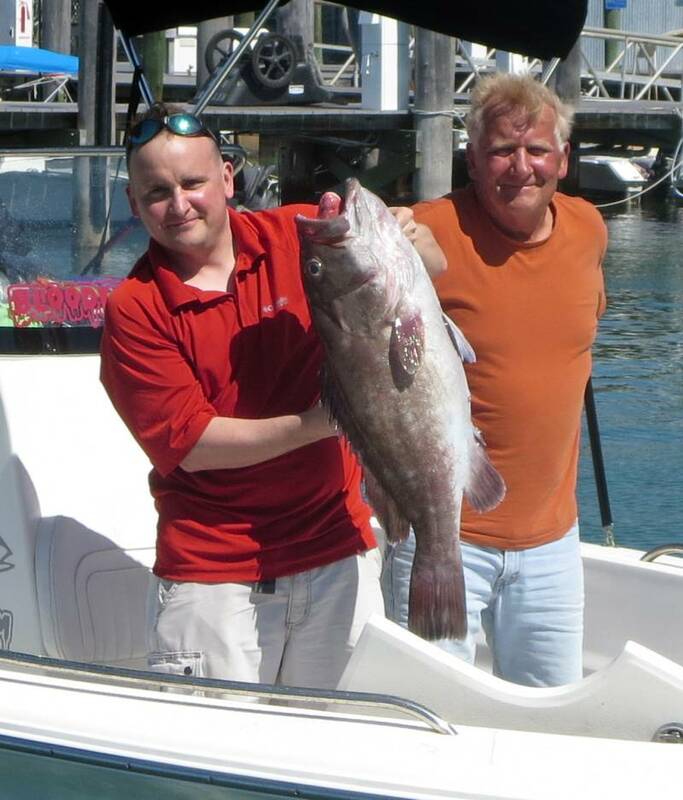 He was out fishing today with two guys and they caught a huge grouper and several tile fish. He filleted one of the tile fish for our dinner tonight, less than three hours out of the ocean! What a great meal! We don't run on the weekends but we still get out for an afternoon walk. I was downtown and photographed a rooster with his mate crossing the street so I waited for him to reach full sunlight for a picture. 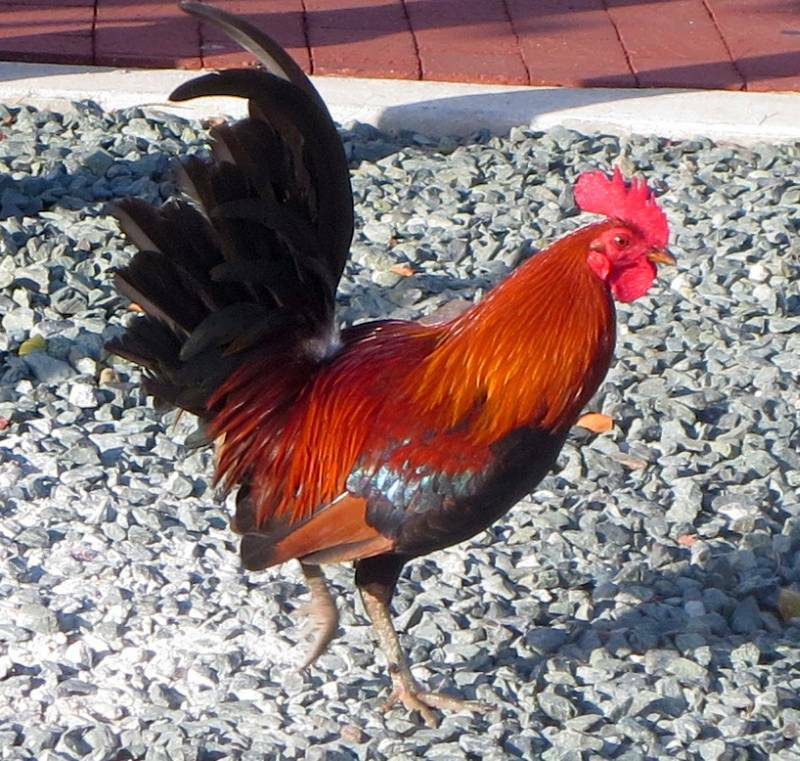 He is typical of roosters in Key West, they all look alike, as do the hens. 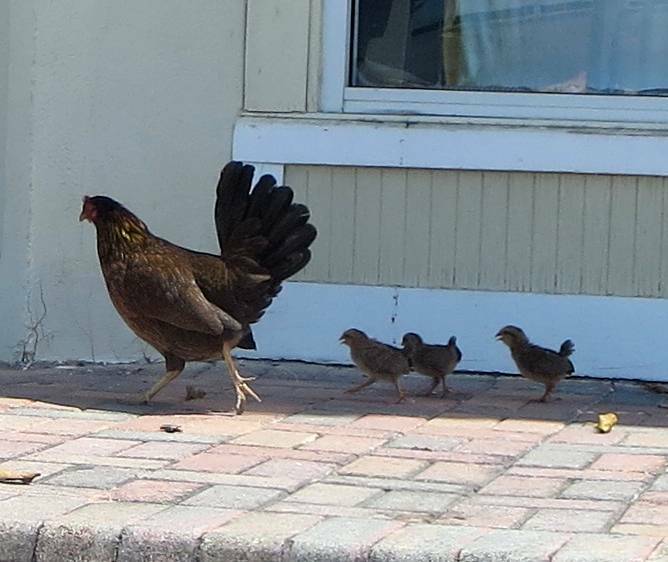 In case you're worried about them reproducing, I saw a hen with three chicks crossing Duval. Everybody stopped traffic so they could get across safely. Once across I took a photo of the hen with her chicks up on a set of steps by the street. 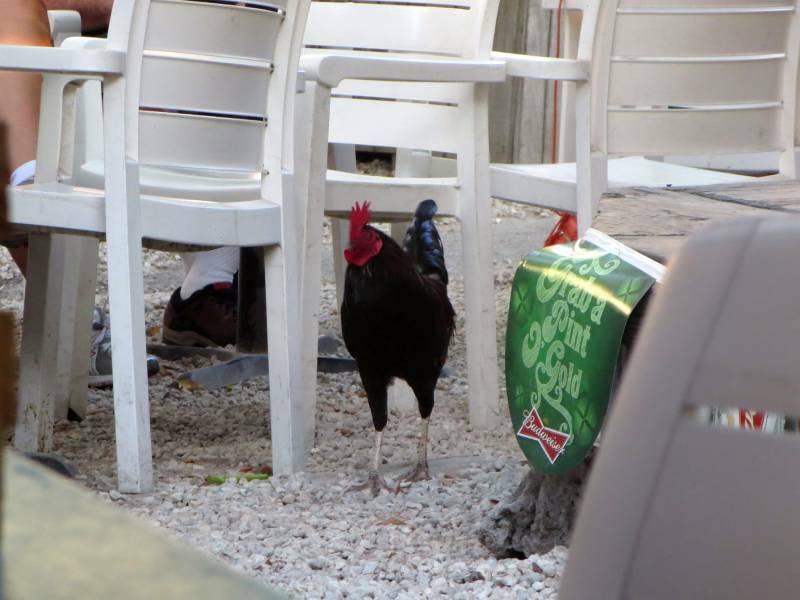 Obviously the chickens seem to be doing fine in Key West. 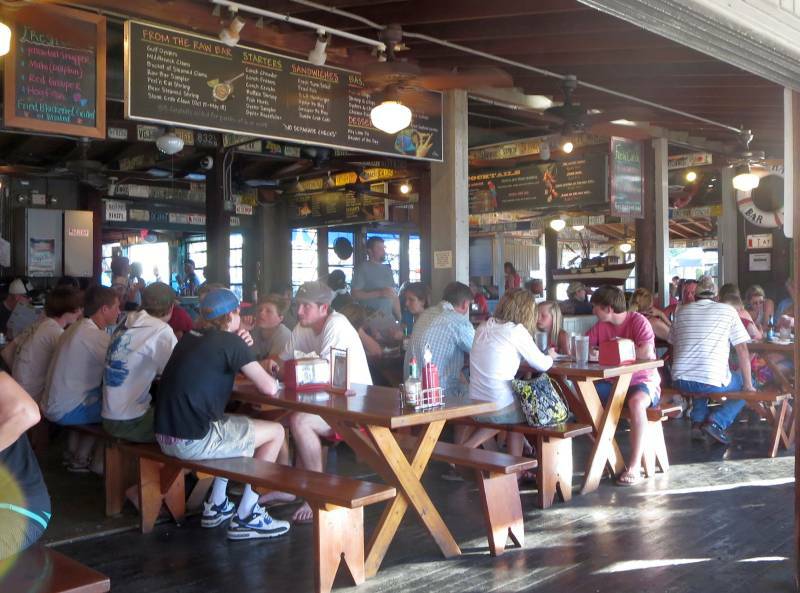 It's not unusual to see them wandering through open air restaurants as you eat at night, especially in places like Blue Heaven and Schooner Wharf which have no walls or roof. 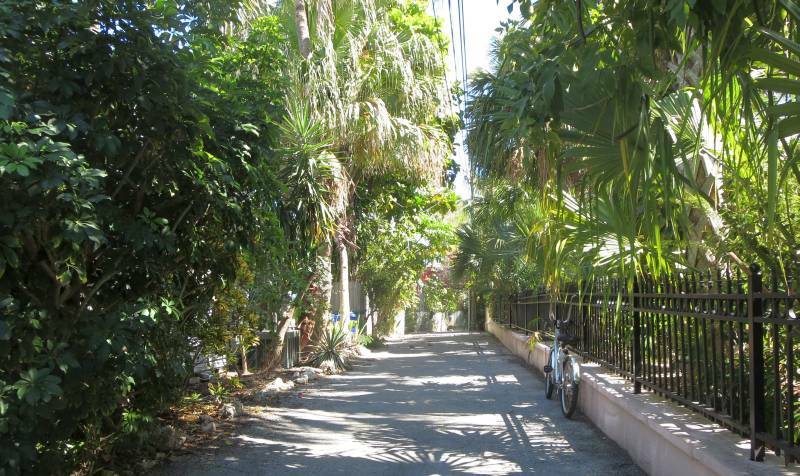 It's all part of the Key West scene. 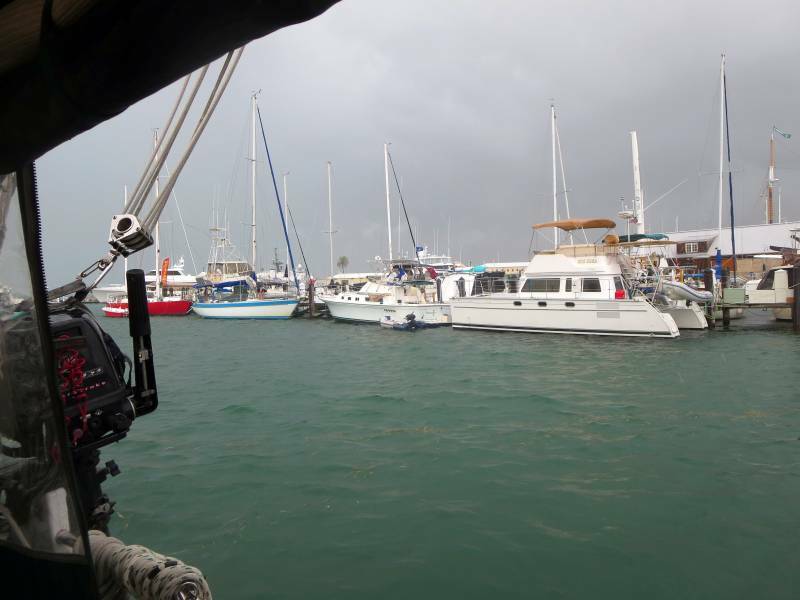 The wind howled today, 20 to 30 knots with 4 to 6 ft waves out in Hawk Channel but we were calm and secure in our berth. The wind is out of the east so we have all of Key West between us and the wind. I had left the computer one last night uploading the three videos of Skraeling and especially the fiddle player so the videos didn't go live until around 10:00 am or so today. 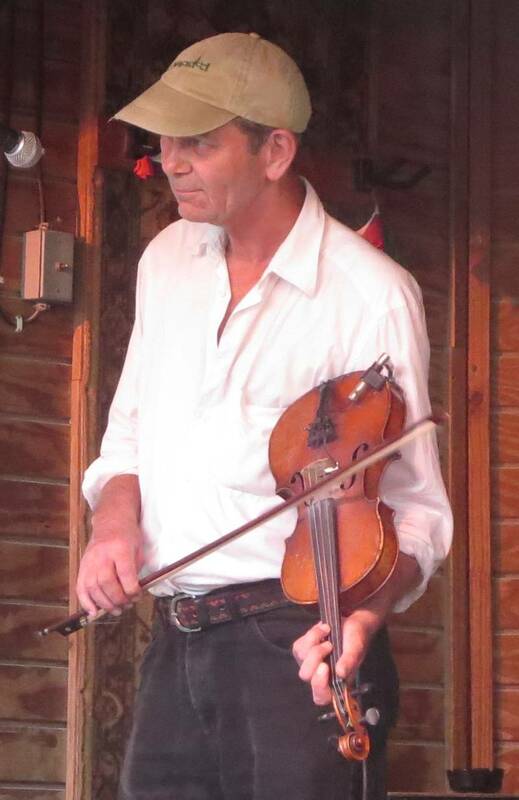 If you didn't see them last night, you ought to scroll down one day and watch the fiddle playing, he's pretty good. I've gotten away from photos of flowers but coming back from the store I was stopped by the sight of one display at one house. 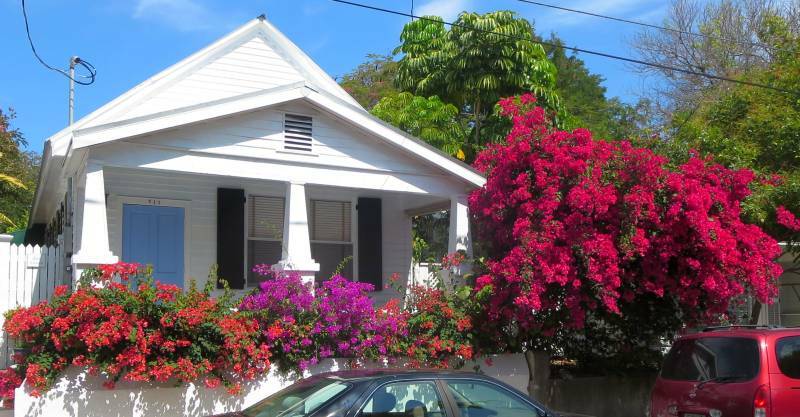 The owner obviously took a lot of care in his plantings. 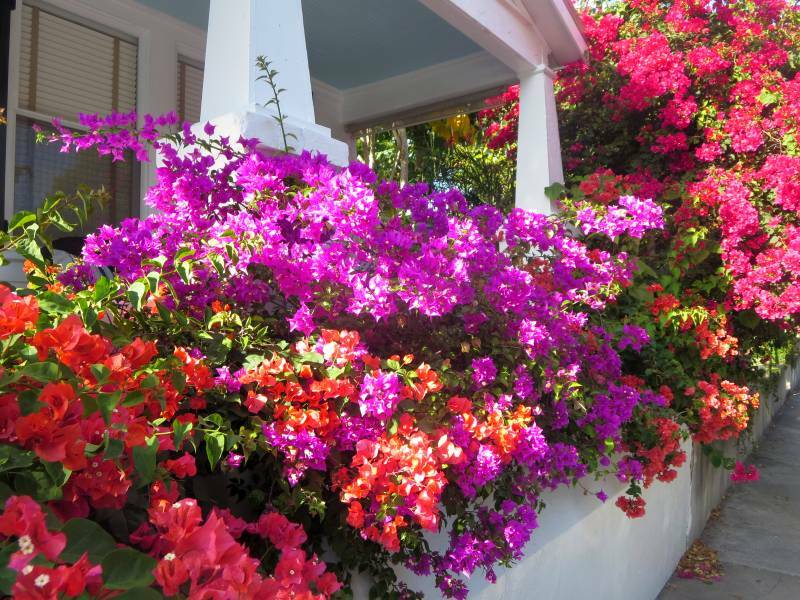 The front porch was just covered, a dazzling display so I just had to take one more picture (above). 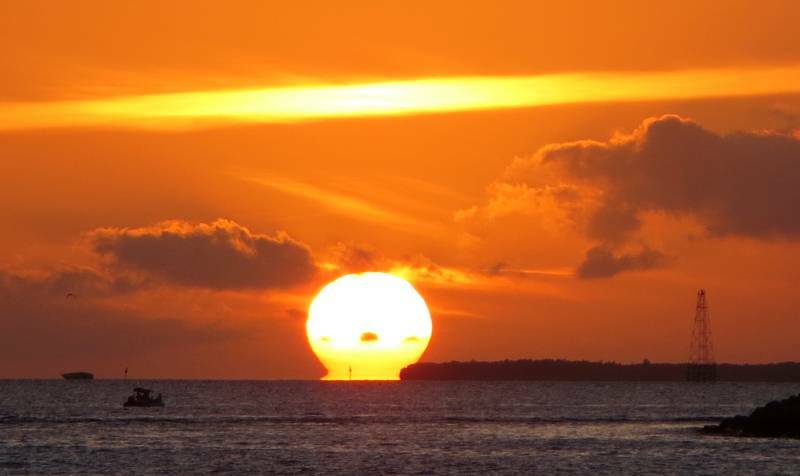 Hoolie and I got our usual walk downs to Mallory Square but we once again didn't see the green flash. 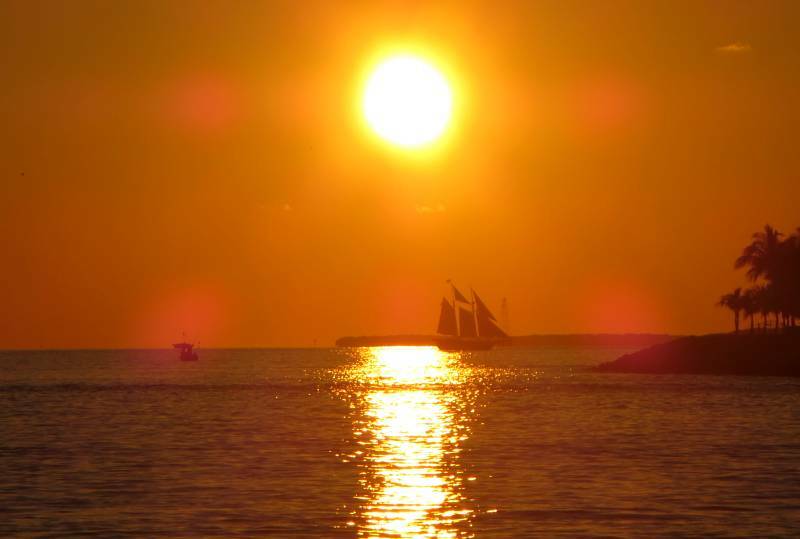 We did see several beautiful schooners pass by and an interesting sunset that looked as if the sun was melting into the horizon. Maybe next time. I took Hoolie over to see the sunset again tonight but the sun disappeared behind clouds once it got close to the horizon. The place was packed as usual with the usual contingent of performers along with the spectators. 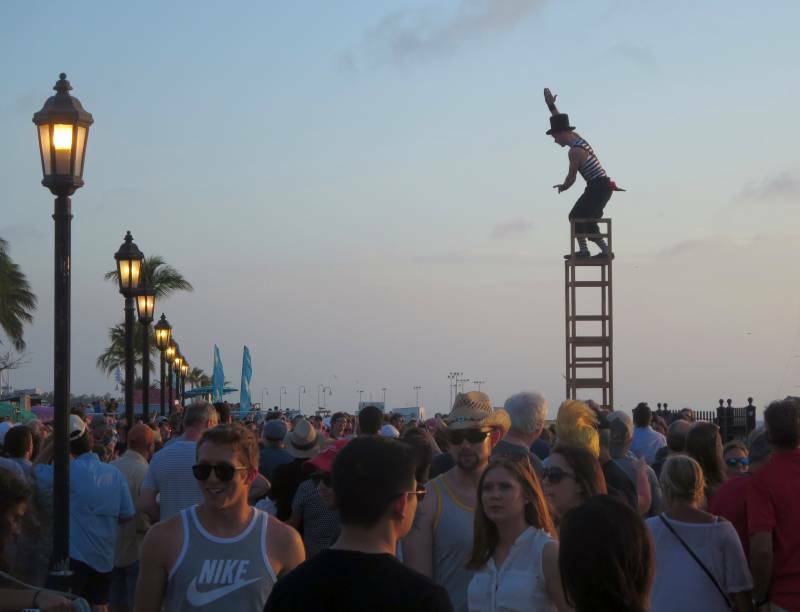 The performers have to be selected to appear at Mallory Square, not just anyone can barge in. 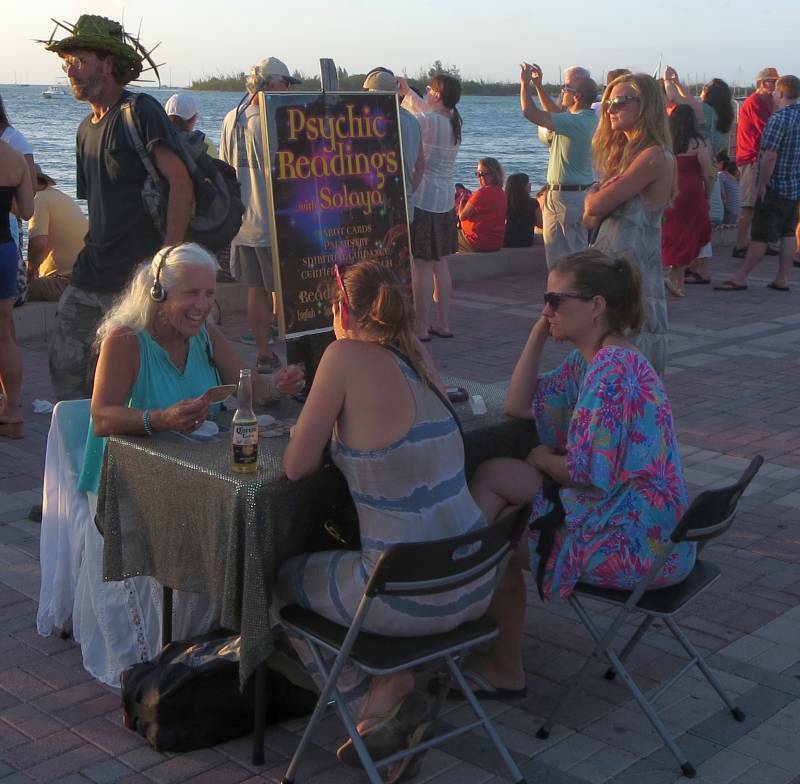 So at any time there may be a dozen or so acts in progress as everyone waits for the sunset. It was nice but again no chance for a green flash tonight. 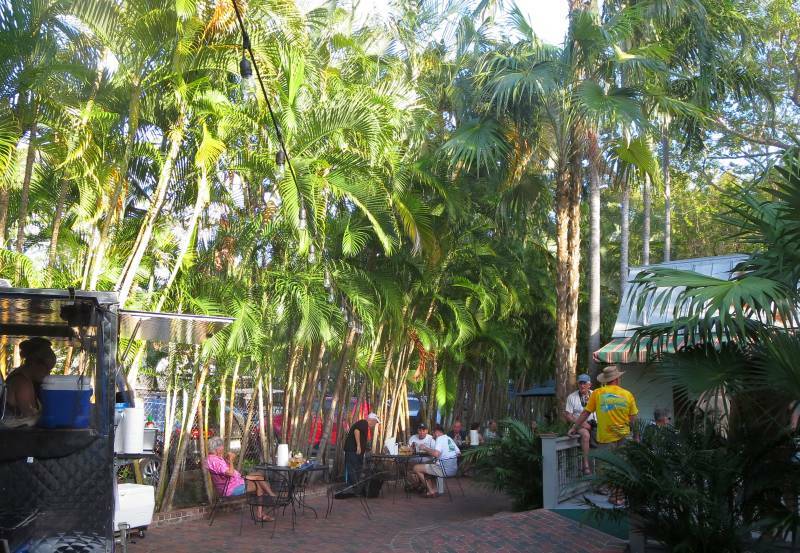 After dinner it was off to Schooner Wharf. Tonight Skraeling was performing. It's a three person band with an Irish focus. The star of the show was the fiddler, he was fantastic. Take a look at the three short videos, here, here and here. 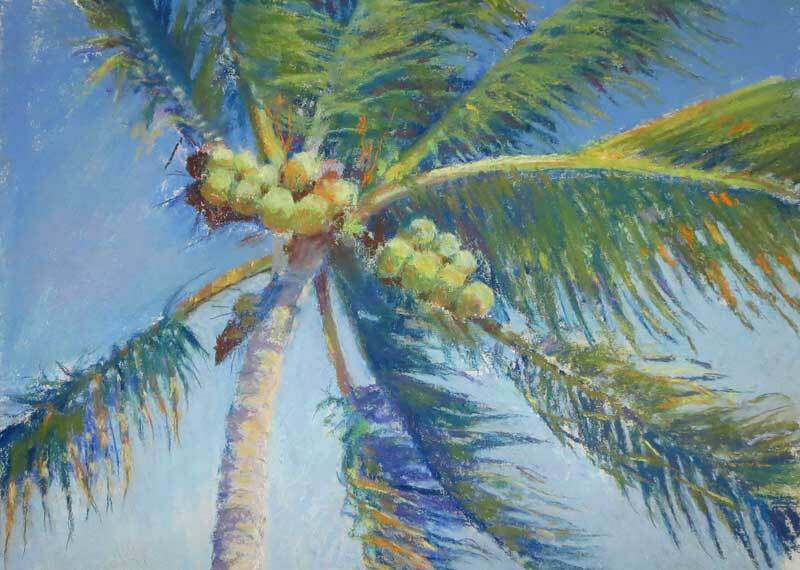 Ann completed her most recent pastel, one of a view of a palm tree looking up into the sky. She's had great success this year compared to previous years in doing serious painting. It takes a block of time without interruptions to get the creative juices flowing. 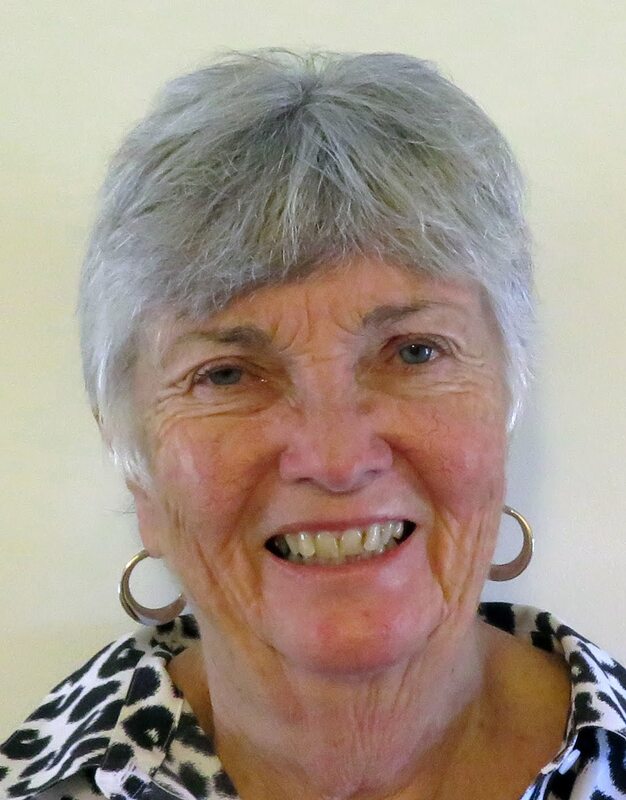 With the extra month in Key West this year, she's had the time. 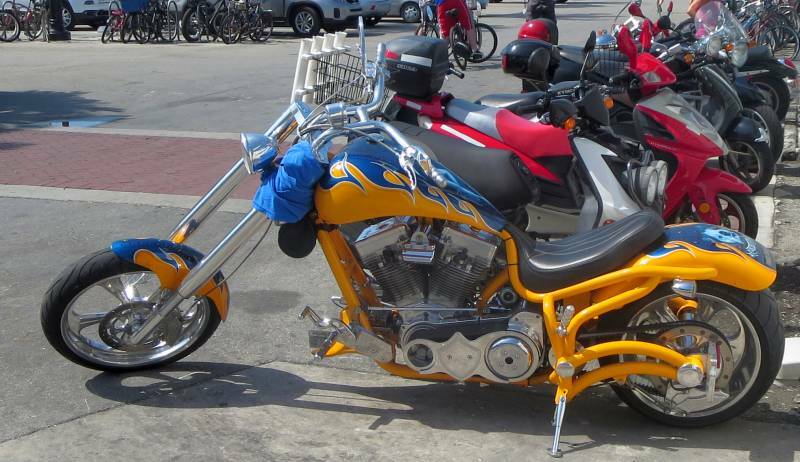 I took a walk this morning and saw a custom chopper that looked pretty good. It was parked outside of the Raw Bar, nice paint job. We had heard so much about Garbo's Grill that we just had to try it. 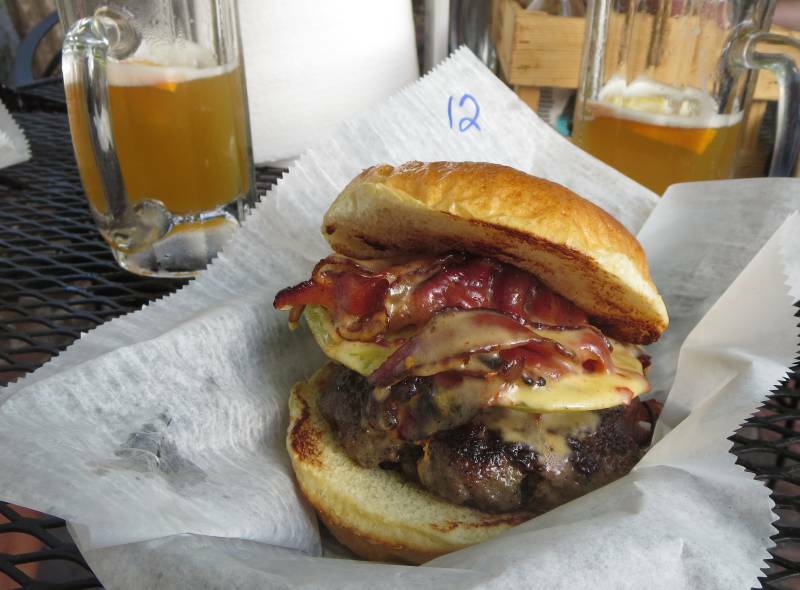 It's been featured on the Foot Network in the section on roadside diners and was one of only 25 restaurants invited to compete in the best burger cookoff in Miami, Florida. Garbo's Grill is listed as one of the 100 highest rated restaurants in US per the Tripadvisor and yet it's a food wagon parked behind Grunt's Bar. The Umami Burger - fantastic! Ann had the fish taco but I had the 1/2 pound Umami burger with Angus ground beef, applewood bacon, heirloom tomato and Boars Head chipotle gouda, it was fantastic and cost only $9. We are sure to go back and try the rest of the menu. For drinks we had a draft Belgium beer for $3 each, very reasonable dinner! It's still warm, 78 outside so we have the A/C going to cool off the main cabin and also lower the humidity. 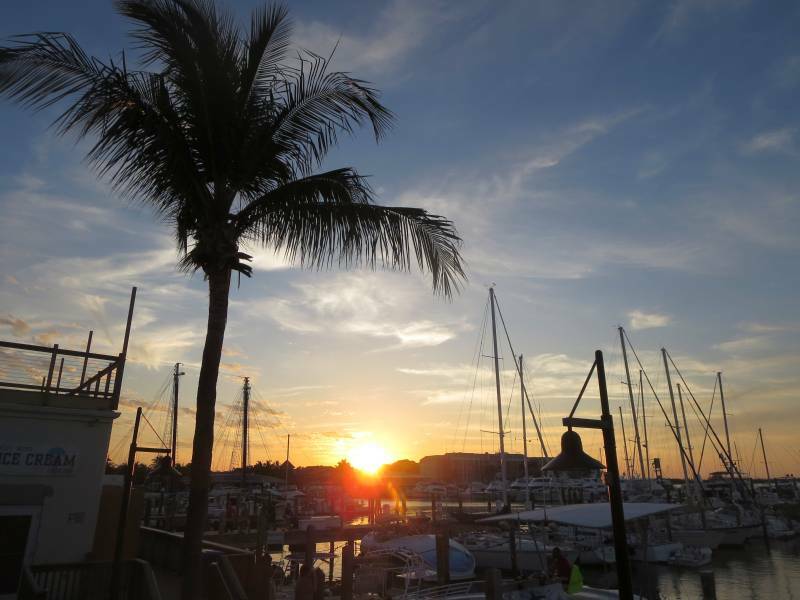 Summer is coming in Key West but it still rarely gets above 81 down so far. We decide what to do day to day, what better way to plan?